"We are very excited about working with IBA. We believe IBA brings the best technology to the table; we believe that they have the most experience in the world of proton therapy... they are the group most likely to come through ..."
Dr. James Metz, M.D., Chair of Penn Medicine Department of Radiation Oncology"
"Following a comprehensive public tender, we have chosen IBA because it provides the proton therapy solution that best fits our needs." Marc Decramer, Chief Executive Officer, UZ Leuven"
"The professional support and responsiveness that IBA has demonstrated throughout our 10 year relationship has helped us deliver proton therapy to over 6500 patients." Nancy Mendenhall,Medical Director, UF Health Proton Therapy Institute "
Interested in discovering other testimonials ? Would you like to learn more about our solutions ? IBA is the worldwide leader in proton therapy technology. 65% of proton therapy patients have been treated using IBA technology to date. The company has been leading proton therapy for the last 30 years and has built the largest user community of the world's best proton therapy centers. Based on this experience, IBA offers the highest uptime rates and can install your system in less than 12 months. Work with the leader in innovation - IBA - the best in proton therapy today and tomorrow. We're IBA, the leader in proton therapy technology. 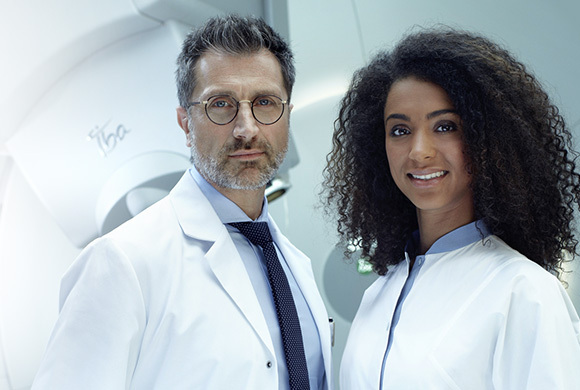 The proven safety, reliability and upgradability of our centers enables our clinical partners to treat a wide range of medical indications and deliver advanced treatment options. Uniquely collaborative, IBA’s trusted community of experts gets all the details right. This means fewer headaches, a higher return on investment and greater patient satisfaction. We understand that providing cancer care requires highly complex and integrated solutions. It is thanks to our unique, open culture of sharing, unmatched trainings and user meetings that we will further strengthen the clinical and patient communities we have always cared for. With more than 40 partner institutions, IBA has the largest user community in proton therapy. We are the only company offering a true continuum of Intensity Modulated Proton Therapy equipment and services. From single-room ProteusONE to the made-to-measure ProteusPLUS, we offer fast integration of PBS and 3D CBCT into workflows. We are the first company to introduce Pencil Beam Scanning, In-room CT, Cone Beam CT for clinical use in proton therapy. IBA - the best in proton therapy today and tomorrow. Contact IBA today to learn more about how can we help you to build or operate your center. Looking for more clinical evidence?